Here’s a Thanksgiving example I scanned of Willie Westinghouse Edison Smith, The Boy Inventor by Frank Crane from November 25, 1906. You know how sometimes when you tell someone something you saw that was funny, but it isn’t funny at all when you describe it? Well, this is a strip apparently devoted to that phenomenon. 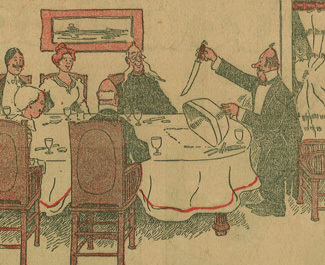 There is also a lovely Howdy Doody-like illustration in the middle of the page by “Walker” or “Halker”… if you can identify this cartoonist, please let me know and I’ll update the post. Bonus points if you can identify any of the characters in the illustration. 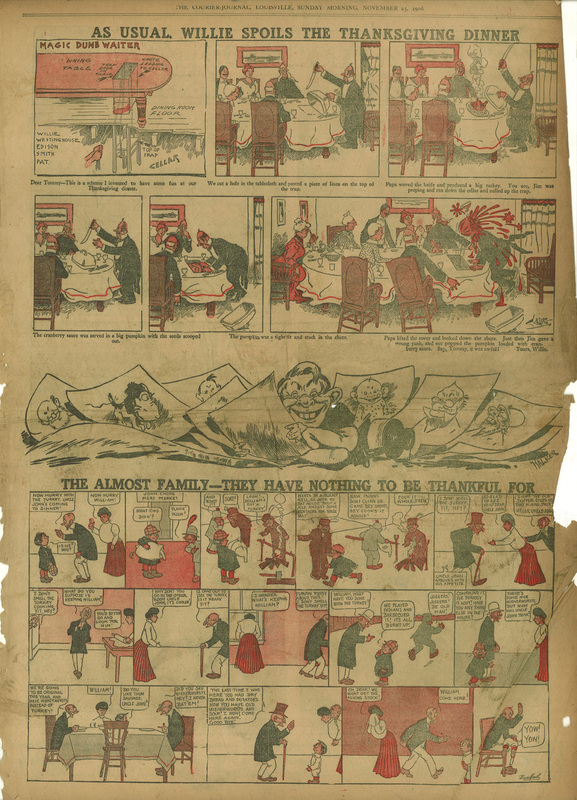 To top it off (or bottom it out, as the case may be) we have The Almost Family- They Have Nothing to Be Thankful For by W.R. Bradford. It appears to be a Little Jimmy clone from this example, right down to the corporal punishment in the last panel. Please be advised that like many of the comic strips of the era, it contains offensive racial overtones. If this sort of thing offends you, you may not want to view it. Click here to read about W.R. Bradford at lambiek.net. Click here to read about Frank Crane at lambiek.net.